"Hamilton Sterling's dark and skeptical film Faith of our Fathers was a hit at the Los Angeles Film Festival a couple of years back. Since that time, it has played in art houses from New York to Cairo, to audiences who have found its strange mix of parable and borderline documentary/manifesto style both alluring and disturbing. One thing noted by reviewers and spectators alike has been the importance of the music -- with opera singers, prepared piano and exotic percussion augmenting a traditional orchestra -- to the themes of the film. This is a CD of the full score, plus several bonus tracks. 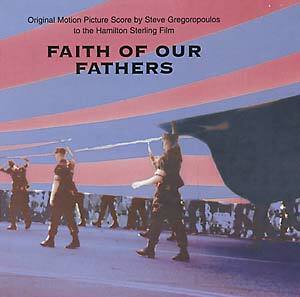 All the music was composed, arranged and conducted by Steve Gregoropoulos and was produced by the director. It features several well-known names in new music in Los Angeles in uncredited (but nonetheless stellar) performances."